This was a bit of a slow month. As usual, office work and family are taking most of my free time, and there wasn't much progress. I did dedicate some time planning some of the optional story elements, and how they will appear in game. The research and rescue teams are now given a little more exposition than before, having dedicated areas and not just being some object that triggered a log update. Production of the required assets has begun, and research of other aspects is underway (GF soldiers and their ship designs need to match their design in past games). On the next update there will be a progress report. I'll dedicate this week to list of the remaining aspects that need revisions in all the areas. As always, thank you very much for following the project. I don't care how you do it, but when this game is done I am paying you for it. That much time dedicated to an amazing remake of a game. Set up a donation option somewhere so I can not pay you for the game but for your time and skills! Awesome, great to hear that another percentage update is on the way! Wow that trailer looks professional! Made me even more excited for the game. 1st! Thanks as always for the update doc! Have you ever thought about talking to Nintendo about possibly getting the to be an officially licensed Nintendo product? If that's even possible anyway. This is so well done, and it's not like they'll ever bother to revisit this game. Not to mention I don't think it would cost them a horrible amount of money to put it up for download on the eShop or the WiiU shop, so if it didn't do well it wouldn't hurt them. Please, I beg, do not manually add black bars on the left & right of non-widescreen videos! When playing back the video in fullscreen on a non-widescreen display (iPad, older PC monitor, etc), you get black bars on ALL sides of the video aka "windowboxing". Makes me skeptical if Samus will even find or encounter any living GF Soldiers at all. I always get this impression that they were all wiped out by the Metroids because they were unprepared for their evolutions. From the summary of "Return of Samus" it sounds like the GF teams that were sent to SR388 disappeared as if they went to the planet version of the Bermuda Triangle. Cant wait for this game to be finished! Just finished the demo and also just finished the original Metroid II for the first time. Very excited to see what you come up with for the omega metroid and Queen boss battles. Oh, and the music is very Metroid like. The amount of hype for this is just through the roof! Heh, I had a feeling the GF crews would be more fleshed out a long time ago sense it was given note when the first logbook came out. I loved the subtle polish you've given to some of the rooms, as well as the Coming Soon at the end of the trailer. Could it be...? Optional story elements? That sounds interessting to me! Btw did you thought about changing the battle music for the gammas ? I really like your work and I visit your blog almost everey day. So keep up the good work! Let me tell you this I Love You thak you very much for making this game. You should release a Soundtrack to the game really. That was fantastic! I am a mexican fan of you and Samus and all this metroid universe, congratulations for your effort. I don't know if you know about this but: Metroid Metal has some awesome music, i bet you could ask the band if you could use some of it. They even have an EPIC remake of the M2Q Queen Metroid theme. I love the demo its feels like like a classic Metroid game! I think the Zero Suit would be cool in this game. Try to use the reserve tanks from "Super Metroid". Don't give up on the game, you are doing an unbelievable job!!! can you play the game to the end yet or is everything just to make a few levels look pretty? I love the demo it actually feels like a Metroid game from Nintendo. I think the Zero suit would go great in the game. I would call the last area, "Queen's Lair". I believe you can finish this game, you are doing an unbelievable job! This is very nice project. I like to read about such projects. I like your post. Keep up the good work, man! Metroid fans are counting on you. I was just thinking about this today because I heard it on a playlist, but you should maybe contact the guys in Stemage who have a project called Metroid Metal. Maybe they wouldn't mind if you use it for this project? They have a sweet version of the main tunnel theme that would fit perfectly. I know you are redoing a lot of the music but this might take a bit of the weight off your shoulders. Great work though, Doc! Keep it up! Way back when you first started this project I was excited for it, but I didn't have a computer. Now in 2013 I finally have one, and one of the first things I did with it was to check out AM2R in hopes it was done. Unfortunately it wasn't released yet, but I was incredibly happy to be able to play through the demo. Also nice work with Danger in Old Tourian from Harmony of a Hunter. You are doing great. Just played through the demo, keep up the good work - hope the whole game will be available in the future! Me da que antes de ver el juego acabado, me hare millonario. Hey. This game is awesome so far. 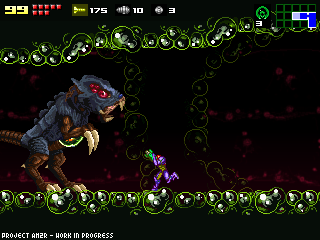 Since the metroids were made to keep the x parasites in check, would you mind adding a single x parasite hidden somewhere in the game, that you only see for a brief second? That would be a cool easter egg :). its justs keeps better and better !! This looks so seriously well made. You should be proud! I can't wait until it's able to grace my PC. I am absolutely buying this game when it comes out, I don't care if it's free. Please DO supply us with a donation link, as your fans will likely love to show our appreciation!